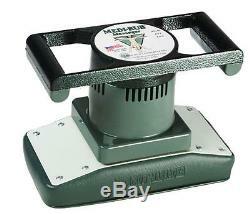 New Medi-Rub 2000 Plus Professional Body Massager. The Medi-Rub Body Massager is the first choice of Chiropractors, doctors, massage therapists and professional athletes. DEEP, therapeutic massage improves circulation, muscle tone and helps prevent muscle atrophy. Designed for professional use with ball bearing oscillating action. Easy to use vinyl pad. Used in the Medical Industry. Penetrates deep through all muscle layers. Easy to control, very gentle on the hands. 3500 High - 2800 Low. Techniques on how to maximize the effectiveness of your Medi-Rub Massagers. Carpal Tunnel Syndrome and Arthritis. Place it on a level surface, turn it on and place your forearm and wrist on the soft pad. Be sure to keep your hand and wrist level for maximum effect. Duration: 7-15 minutes per wrist. Leg Cramps and restless leg syndrome. Place it on a level surface, turn it on and place the cramping calf muscle in the soft pad. Neck and upper back pain. Turn on the Body Massager. Using one hand reach behind your neck and place massager on cramping muscle. This technique is even easier if you invert the massager, turn it on and lie back against it, using the soft pad like a neck cushion. Also works great for tension headaches. Thighs, Hips and Upper Leg area. Turn the Body Massager on and place directly over cramping, painful muscle tissue. Move the Massager in a circular and back & forth motion. You will feel warmth as the blood flow is increased in the area. This method is also good for agitating cellulite in the hips and thighs. Duration: 10-15 minutes or until muscle tissue is relaxed. Upper Back, Between Shoulder Blades. Wonderful for relaxing and soothing knotted and painful back muscles. This is the technique used by Chiropractors and Physical Therapists on patients. The Body Massager is used in a gentle circular massaging motion. No pressure is necessary, allow the massager to do all the work. Simply guide the Massager over the focal area. This technique can also be used on bare skin with massage oils. Duration: As long as necessary to relax muscle tissue. Lower Back Pain and Cramping. Turn on the Body Massager, reach around and place massager on the cramping muscle. Unless you are very flexible, do not attempt this technique at home. A better method is to place the Body Massager between you and a sofa or high backed chair. Sit back against the soft pad of the massager and let the massager stimulate the blood circulation in the muscle tissue. Duration: 7-10 minutes or cramping has eased. The item "Medi-Rub 2000 Plus 2 Speed Professional Body Massager NEW SAME DAY SHIPPING" is in sale since Friday, May 3, 2013. This item is in the category "Health & Beauty\Massage\Massagers". The seller is "devinesuperstore" and is located in Whittier, California. This item can be shipped to United States, Canada, United Kingdom, Denmark, Romania, Slovakia, Bulgaria, Czech republic, Finland, Hungary, Latvia, Lithuania, Malta, Estonia, Australia, Greece, Portugal, Cyprus, Slovenia, Japan, China, Sweden, South Korea, Indonesia, Taiwan, South africa, Thailand, Belgium, France, Hong Kong, Ireland, Netherlands, Poland, Spain, Italy, Germany, Austria, Bahamas, Israel, Mexico, New Zealand, Philippines, Singapore, Switzerland, Saudi arabia, Ukraine, United arab emirates, Qatar, Kuwait, Bahrain, Croatia, Malaysia, Chile, Colombia, Panama, Trinidad and tobago, Viet nam, Uruguay.